Pixel TF-325 Hot Shoe Converter x1pcs. flash diffusers. lens adapter. AF comfire adapter. speedlite light. Or if the product was sent to you in error by our staff. Just give us the opportunity to resolve a problem. Lightweight, compact flash bracket with rotating flash arm. Rotating flash arm for vertical shots reduces background shadows. DIY Grid Material. Grid made from Aluminum. Grid Thickness:~3/8". Cut to size with an x-acto knife. We kindly ask you to be patient. Powder Coated Black. Flash Bracket Swivel Umbrella Holder Studio Tilting Bracket for Nikon Canon E430 E580 SB600 SB800 SB900. Including screw fittings for the umbrella, flash mount and tripod/stand mount. Perfect compatible for your Speedlite. Compatibility: for Nikon SB-900 Speedlite. This flash diffuser is an essential piece of kit that any level of the photographer should own. The diffuser box fits snugly on to the compatible flash unit without the use of fastenings and simply diffuses the light output of the flash, producing softer shadows. Perfect compatible for your Speedlite. Compatibility: for Nikon SB-900 /SB-910 Speedlite. This flash diffuser is an essential piece of kit that any level of the photographer should own. The diffuser box fits snugly on to the compatible flash unit without the use of fastenings and simply diffuses the light output of the flash, producing softer shadows. 2 x Hot Shoe Cover. Get It Fast. Suitable For. 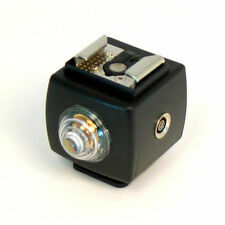 Suitable for most DV / mini DV camcorder / DC / SLR camreas standard 1/4 "tripod socket. 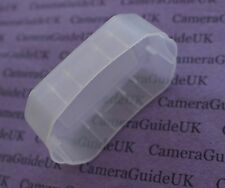 This is a C-Shape flash bracket designed for mini camcorders and DSLR! For hot shoe flash and flash trigger (not including Sony and Minolta flash hot shoe flashes due to different socket). For Canon Speedlite 580EX/580EX II Speedlite. Perfect compatible for your Speedlite. This flash diffuser is an essential piece of kit that any level of the photographer should own. The diffuser box fits snugly on to the compatible flash unit without the use of fastenings and simply diffuses the light output of the flash, producing softer shadows. Mount hotshoe flash on Light Stand or Tripod with this umbrella stand. Easily adjustable for different lighting positions. And with the umbrella holder that is made into theFlashgun Adapter, you can have portable studio lighting without the hassle. Photo Studio Accessory. 1 x Flash Hot Shoe Mount Adapter. 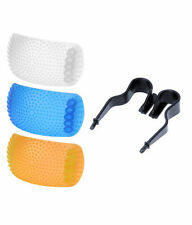 Designed with cold foot, will support a standard hot shoe. Hot shoe supports most flash systems. 1/4” brass bushing in the bottom, suitable for light stands or Tripods with 1/4” screw head. 2X Canon 600EX 600EX-RT Speedlite Flash Softbox Bounce Diffuser Cap Box For Canon 600EX 600EX-RT Flash. Compatibility: for Canon Speedlite 600EX 600EX-RT Speedlite. Perfect compatible for your Speedlite. You will receive: 1 x 2.5mm plug to male PC sync cable. 2.5mm to Male Pc Sync Type. Work on most flashes that take a single pin plug. Evenly illuminate close subjects with soft, flattering light from theYN-14EX-C Macro Ring Lite fromYongnuo. The twin-tube design also allows users to set each side to different power ratios, enabling higher contrast lighting when desired. Colour: Black Model: L type 100% brand new Applies to: photographic equipment Material:Metal,sponge Package Contents: 1x photographic support Note: Light shooting and different displays may cause the color of the item in the picture a little different from the real thing. The measurement allowed error is /- 1-3cm. Brand Unbranded MPN Does not apply UPC 191466234457 EAN 191466234457 ISBN 191466234457 Designer/Brand Unbranded. New 1 foot long PC Male to PC Male sync cord. 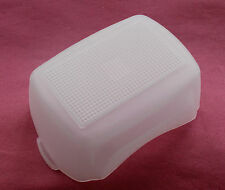 F58AM Flash Softbox Bounce Diffuser Cap Box for Sony F58AM Speedlite. For Sony F58AM Speedlite. Perfect compatible for your Speedlite. This flash diffuser is an essential piece of kit that any level of the photographer should own. I will sell 2 of these items for $20.00. 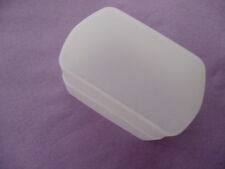 This item is new in factory packaging and box. Please see pictures of instructions to determine exactly what it is and its function. I could not find anything online about this product. I also have 20 of these items all brand new and will sell at a discounted price. Thank you for looking! With umbrella hole in the center, allows flash spot closer to the center. The hot shoe is adjustable so that it can attach all flash guns in the market. 1/4" adapter screw, can support different kinds of 1/4" light stands or tripods. Quickly hot shoe clip design, can mount flashgun, LED light, monitor etc. A SCA 300 A is also needed for this to work properly. It is compatible with the EM, FE, FG, FM2. This unit is in good, clean condition. For Sony Speedlite F42AM. 1x Flash Diffuser Softbox. Perfect compatible for your Speedlite. This flash diffuser is an essential piece of kit that any level of the photographer should own. The diffuser box fits snugly on to the compatible flash unit without the use of fastenings and simply diffuses the light output of the flash, producing softer shadows. 1 pcs/set as picture show. Color:Black. Condition: New. For Canon Speedlite 430EX/430EX II Speedlite. Perfect compatible for your Speedlite. This flash diffuser is an essential piece of kit that any level of the photographer should own. The diffuser box fits snugly on to the compatible flash unit without the use of fastenings and simply diffuses the light output of the flash, producing softer shadows.